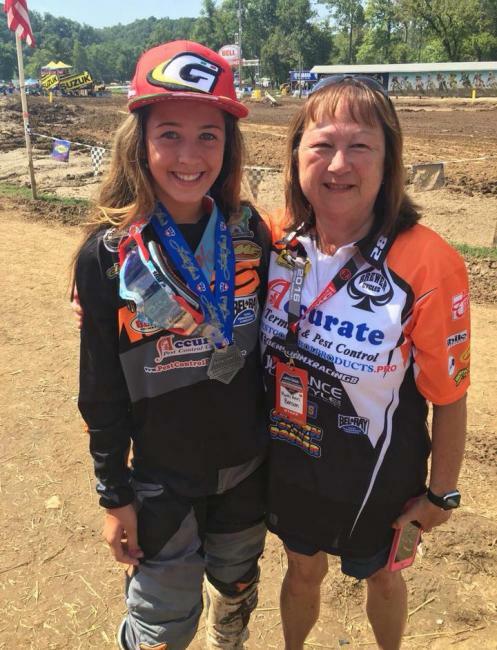 The GNCC Racing Family and Loretta Lynn Amateur National Motocross Family lost one of their biggest fans this past Monday, March 19th, with the passing of Registration Technician Ruth Ann Benson. Ruth Ann, 59, of Delmar, Maryland, died peacefully at her home after a hard-fought battle with cancer. Ruth Ann joined the MX Sports Registration Team in 2013 and the GNCC Registration Team in 2015 at the Ironman. Quick with a smile and a friendly laugh, Ruth Ann was known as “Office Depot” to her colleagues, as she was always well-stocked with every supply, paperclip, pen, condiment, candy, you could ever want or imagine. Like so many supportive race family members, Ruth Ann never raced or rode a motorcycle. But she loved being around them none-the-less, and loved how it brought her family together and introduced them to new families that enjoyed the same experiences. Through racing she developed a network of family, friends and colleagues all over the country. Although long retired from the banking industry as a loan processing officer, taking care of racers was her new career. And like every grandmother, Ruth Ann cherished her grandkids, rarely missing a race or baseball game. Ruth Ann is survived by her husband, Randy Benson, two sons, Michael Benson and his wife Pam, and C. Adam Benson and his significant Andrea, and three grandchildren, motocross racers Shelby and Katie Benson, and Ryan Benson. A funeral service will be held on Saturday, March 24, 2018 at 5:00 pm at Holloway Funeral Home in Salisbury, Maryland. A visitation will be held two hours prior to the service. Interment will be private. Following the service at the funeral home a reception with family and friends will be held. In lieu of flowers, contributions may be made to The Road 2 Recovery Foundation, 1042 N El Camino Real, Suite B-350, Encinitas, CA 92024, https://road2recovery.com/donate/. Godspeed, Ruth Ann. And well done.